Melaleuca wilsonii, Wilson’s Honey-myrtle, is a dense shrub that reaches a height of two metres in our cold climate garden, northern NSW. Leaves are decussate (having a cross-like arrangement when viewed from above), linear and pointed. Flower spikes are deep pink to mauve-purple. Spikes are carried on old wood and may be very long sometimes exceeding ten centimetres in length. Blooms are both prominent and prolific. Melaleuca wilsonii will grow in moderately saline areas and will cope with inundation for lengthy periods. Our garden is perched on a well-drained 900 metre high hill and our specimens survive, thrive and bloom bounteously. 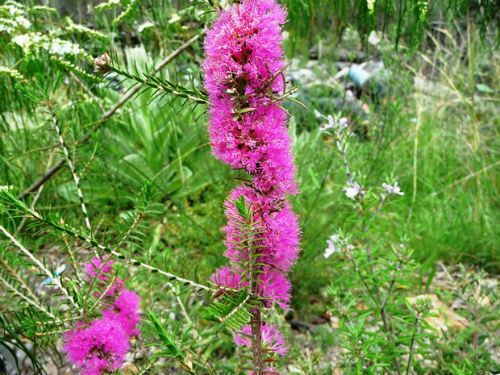 Melaleuca wilsonii is a native of south-east South Australia and north-west Victoria. Many years ago, we were travelling in western Victoria and came across a large population of Melaleuca wilsonii growing in a swampy area and were in full flower. We were so taken by this floral extravaganza that we nearly drove off the road. This species may be propagated from seed or cuttings. We find that cuttings propagate readily and rapidly.